Ultra-Precision Jig Grinder. Introducing our next generation jig grinding center with accuracies and repeatability beyond what is available from any other system. Built upon many proven principles used in our leading single point diamond turning systems, the 400UPJG was engineered and constructed to achieve true ultra-precision sub-micron tolerances. It offers both high productivity and advanced operating simplicity. 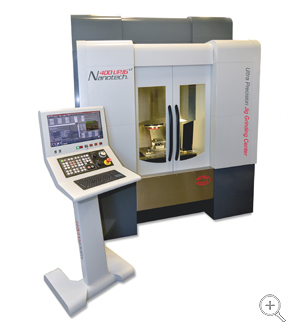 The machine features our latest advancements in "precision engineered" designs and components. These include ultra stiff oil hydrostatic bearing slide ways and state-of-the-art dual “iron-less” linear motor drives which eliminate any backlash or hysteresis in the axis motion. The base is designed for high damping, thermal compatibility with the slide components and for long life corrosion resistance against cutting fluids. It has been engineered as a single monolithic structure with an enclosed bridge to provide maximum structural stiffness both statically and dynamically in order to optimize complex roughing and finishing operations while achieving a much higher geometric accuracy. The system is powered by a high speed 64 bit Delta Tau PowerPMAC motion controller and a touch / swipe gesture "smart" screen display. Our exlusive HMI software, NanoSMART, consists of three customizable 22" wide screens that are accessible by swiping left or right from the main screen, keeping all the information you need at your finger tips. The customization capability allows the user to now manage their programming and monitoring preferences while a fully integrated jig-grinding cycle routine mimics the operation of traditional jig-grinders. Our proprietary software and control system boasts a 10 nanometer (0.00001mm) programming resolution with a 1.0 nanometer (0.000001mm) feedback resolution. 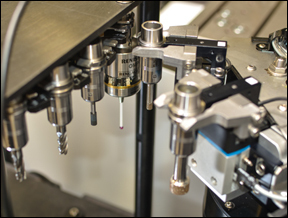 Contact us to discuss your specific ultra precision applications..
For a list of accessories available for this machine, please visit our Factory Options and Additional Accessories pages.